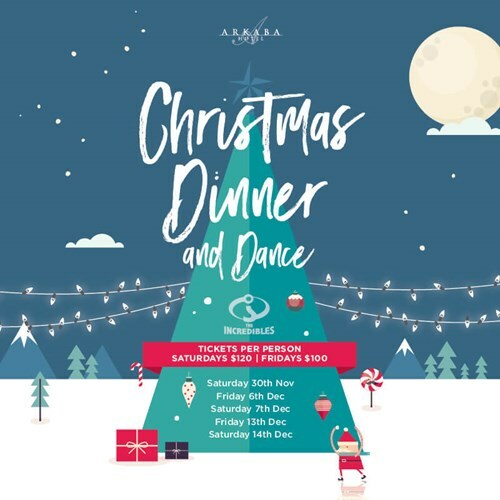 Get the whole crew together for the Arkaba Christmas Dinner & Dance! Jingle all the way with Adelaide's number one party band The Incredibles playing the best party music from all eras, along with some of your rockin' Christmas classics. Be quick and book your table now. Doors open at 7pm. To book choose your date from the drop down box above, or call Arkaba reception on 8338 1100. All online bookings are subject to a booking fee per person. Direct Bookings - A deposit of $25 per person is to be paid within 7 days of booking. Deposits are non refundable and non transferable. The total balance is due 1 month prior to event. Bookings made after this date must be paid for in full at time of booking. All bookings are to have one contact person for booking and payment. Online Bookings - Bookings can be made online through www.arkabahotel.com.au. When booking online, full payment is required at time of booking. Guests can pay separately online but must put a “table captain” name in the comments when booking to ensure they are on the correct table. All payments are strictly nonrefundable. In the instance of a reduction in numbers, any payments already made will be forfeited. All guests requiring special dietary needs must contact reception at least one week prior to the event. Undisclosed dietary requirements may incur additional charges.